The prospects of almost one million people participate in Sunday’s rally on Macedonia at the Constitution Square in Athens has ignited a political turmoil in Greece. Many leadership members of opposition parties, including New Democracy which has supported the so called “national line” on the name issue, will plan to attend the rally, expecting to profit from the differences existing between the two governing coalition parties, SYRIZA and Independent Greeks. Among those leaders is former Prime Minister Andonis Samaras whose hard-line as foreign minister in 1992 forced then Prime Minister Konstantinos Mitsotakis to expel him from the government. A year later, Samaras’ opposition on the name issue forced Mitsotakis’ government to resign. 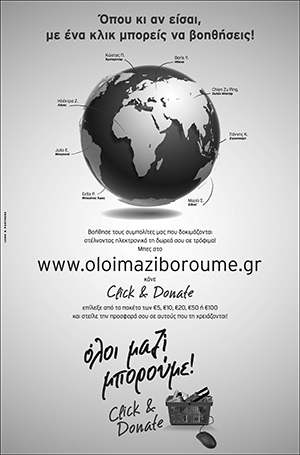 In September 2014, Greek Foreign Minister Evangelos Venizelos, expressing the views of the government of Mr. Samaras, was saying at the 69th Session of the UN General Assembly that Greece supports a complex name for fYROM, “with a geographical qualifier before the word ‘Macedonia’”. This type of opportunism created an inflammatory political atmosphere ahead of the rally. On Saturday, unknown vandals hurled paint on the home of veteran composer Mikis Theodorakis who is to be the main speaker at Sunday’s “Macedonia” protest rally in Athens. 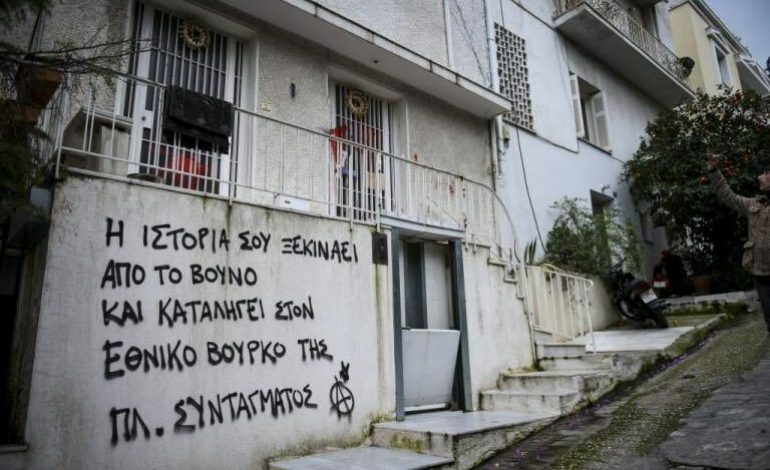 According to police, the assailants used red paint to deface the entrance to the house in the capital’s Acropolis neighborhood and spray-painted threatening messages on the walls. “Your story started in the mountain and will end in the national mire of Syntagma Square,” one message said. According to “Kathimerini”, the organizers of the rally have reportedly accepted a request by a nationalistic political movement comprising army veterans called the Patriotic Union-Hellenic Popular Rally (ELLAS) to “guard” the demonstration from anti-fascist groups and anarchists. Among the “surveillance groups” to be deployed by ELLAS will be members of the ODEYO reserve commandos and the National Salvation Shield. On Thursday, Foreign Minister Nikos Kotzias who is leading the negotiations with fYROM, has received an anonymous letter containing the message “We have three bullets for you,” Citizen Protection Minister Nikos Toskas revealed on Friday in statements to the private broadcaster ANT1. He said the letter arrived on Thursday and was being investigated by police. Toskas underlined that phenomena such as this letter were unacceptable and called on all the political forces to condemn such acts. The minister added that a strong police force will be at Sunday’s rally in Athens over the FYROM name issue. “We have to say that, unfortunately, there are people that have crossed the line so that these people can be separated from the social whole and those wishing to express themselves peacefully can do so,” he added. “It is everyone’s shared view, both the government’s but also I believe of the people intending to take part in the protest, that there should be an expression of their opinion but within a general climate of calm and respect for the democratic system,” Toskas said. The government was not afraid of possible violence at the Sunday’s rally, he added, but had taken all necessary measures to guard against it. “We have an obligation to take measures, we have an obligation to condemn extremist actions…we must set the boundaries between legality and extremist expressions, in the same way that we condemn far- right views and expressions,” he noted. The government has played down the significance of the rally as talks between Greek and FYROM officials on the name dispute enter a critical phase. But authorities are expected to closely watch Sunday’s rally and, sources say, may modify their approach. “Neither is democracy terrorized nor is the government,” Alternate Foreign Minister George Katrougalos said on Saturday in an interview with public broadcaster ERT. “Much less a minister like Nikos Kotzias, who has shown political courage on several occasions, is going to be affected to a minimum”, Katrougalos added one day after the anonymous threatening letter sent to Foreign Minister Nikos Kotzias. Asked whether there were other threatening letters, he replied that “there seem to be others,” adding that he has not spoken to Citizen Protection Minister Nikos Toskas for details. In addition, he stressed the importance of not poisoning the political climate and warned that the main danger is intolerance and division. “Every time our nation is divided, we have not only defeats at diplomatic level but we have far deeper consequences that mark the country’s political course,” he said. In this context, he stressed the need to preserve national unity in the search for the most beneficial national solution. Government spokesman Dimitris Tzanakopoulos reiterated that Greece is seeking three things in the talks: a composite name for all uses, changes to FYROM’s constitution and guarantees against any irredentist claims. Foreign Minister Nikos Kotzias has said he is working on a draft document that would provide the basis of bilateral talks. In a sign of how tensions have peaked over the talks, Kotzias has received two threatening letters, it emerged on Friday. “I have a responsibility towards the country,” Prime Minister Alexis Tsipras said on Saturday, January 21, in a meeting with main opposition New Democracy leader Kyriakos Mitsotakis, government sources told the Athens-Macedonian News Agency. Mitsotakis, according to the same sources, accused him that the government raised the FYROM name issue for political purposes, aiming at the division of New Democracy. On his part, Tsipras assured him that he did not take the relevant initiative to find a solution to the issue in order to divide or to unite any political formation. Moreover, he argued that, as long as he is prime minister of this country, he has a responsibility towards the country and its history. At the same time, Tsipras showcased the targeting of the government regarding the relations with FYROM, saying that he will do his best to solve the issue. “We are determined to exhaust all possibilities to find a solution to the FYROM name issue, defending the national and patriotic interest,” European Parliament Vice President and SYRIZA MEP Dimitris Papadimoulis said on Saturday at a party conference of the Prefecture of Northern Athens in Nea Ionia. “We want a reasonable solution to end the historically wrong approaches of the nationalists of the other side and not to prolong the deadlock,” Papadimoulis added. Our interest is to find a solution to the FYROM name issue that will be of common acceptance, as it has been described by the Prime Minister and the Minister of Foreign Affairs, he stressed. “The integration process of the Western Balkan countries must proceed. The stabilisation of the region is also in Greece’s interest,” main opposition New Democracy (ND) shadow Foreign Minister George Koumoutsakos said on Saturday in an interview with the Athens-Macedonian News Agency. Greece considers the name “Macedonia” to be part of its own cultural heritage, as it is also the name of a historic Greek province that was the core of Alexander the Great’s ancient empire. Athens thus seeks guarantees that the use of the name by its neighbour implies no claim to parts of its own territory. Because of Greece’s objections, Macedonia in 1993 joined the United Nations as the Former Yugoslav Republic of Macedonia (FYROM). To break the deadlock, long-term UN mediator Matthew Nimetz has now proposed several alternative names in Macedonian, including “Republika Nova Makedonija” or the “Republic of New Macedonia”. A resolution of the issue is needed before Macedonia can join NATO or the EU. Greece in 2008 threatened to veto Macedonia’s NATO entry. Skopje subsequently took the issue to the International Court of Justice, which said Athens had been wrong to block its land-locked neighbour’s aspirations. Finding a solution to the FYROM name issue is of primary importance in the country’s acceptance in NATO, an official from the alliance told Athens-Macedonian News Agency (ANA) on Friday. The official reiterated NATO Secretary General Jens Stoltenberg’s statements in Skopje on January 18, who had said after meeting with FYROM Prime Minister Zoran Zaev that the name issue was crucial, but added that reforms also needed to continue. “Agreement on this issue is crucial for your country to join NATO,” the NATO chief had said at a press conference. “The reforms you are working on are also important: good governance; strengthening the rule of law; building an open, multi-ethnic society; and good neighbourly relationships,” he had added. The dispute with Macedonia has festered for decades despite numerous UN-mediated talks to resolve the dispute.